The original, time-proven formula developed by Jim Brobst and produced under exclusive license. J-B has been getting burned-on, caked-in powder residue and copper jacket fouling out of gun barrels since the 1960’s, and hasn’t damaged an inch of rifling yet. Today, J-B once again proves itself a champion by the way it easily cleans the dirtiest, moly-fouled barrels. A unique combination of ingredients and a one-of-kind, multi-step mixing process give J-B its special characteristics. They work together to cushion the abrasive action; the soft paste liquifies as you use it, then wipes out of the bore easily. The non-embedding feature means there’s no abrasive residue left behind which might keep "cutting" after you’ve finished cleaning. J-B has been a favorite on gunsmiths’ benches for years, as a "magic" cure for customer guns that "...just won’t shoot anymore". 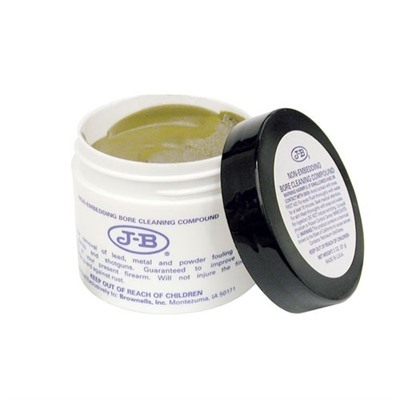 These pros know that a good scrubbing with J-B often restores accuracy. Match and varmint shooters put a lot of rounds down range, many of those using moly coated bullets. The large amounts of copper fouling and the burned-in moly can create a cleaning nightmare; J-B makes short work of it. Use J-B with the Lewis Lead Remover to get the last speck of leading out of pistol bores. 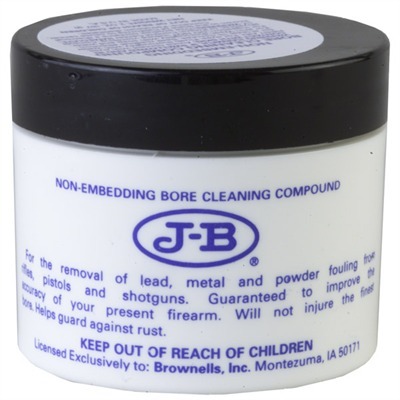 Shotguns combine lead, powder and plastic fouling to really throw patterns off; J-B cleans it all out quickly and easily. Here’s what a couple of the most respected names in the shooting industry have said about J-B. Jim Carmichel, gun writer and dedicated shooter, "I have used J-B for years and routinely use it even on my very finest benchrest rifles. When no other bore cleaner will get the job done, J-B will." The late Warren Page, a benchrest shooting legend, wrote the praises of J-B when it was first introduced to the shooting public. He said, " J-B is an ultra mild, abrasive oil paste, finer than jewelers’ rouge, which we in the rifle accuracy shenanigan, a few years ago, found was the answer to problems of metal fouling and serious powder fouling that solvents either won’t touch, or will cut only by much labor." And, "... it was quickly discovered that such an extremely fine abrasive, used with discretion, would take out caked powder residue and mild metal streaking without ruining the bore." SPECS: 2 oz. (57 g) net contents jar. or ¼ oz. (7 g) net contents jar. Carton contains 12, 2 oz. jars.